TORONTO, ON – Steam Whistle Brewing has announced the release of a unique new package inspired by one of the vans in the brewery’s iconic fleet of vintage delivery and event vehicles. 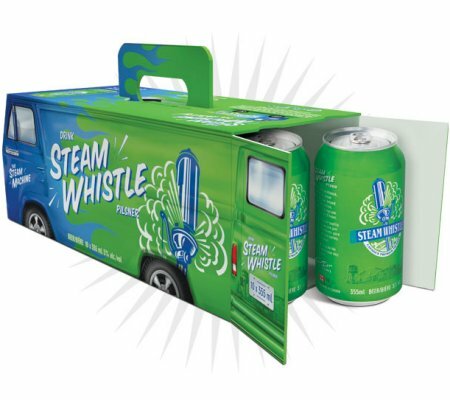 The Steam Whistle Can Van Pack features 10 x 355 ml cans of Steam Whistle Pilsner in a package based on The Steam Machine, a 1967 Ford Econoline Heavy Duty van that was itself inspired by Scooby Doo’s Mystery Machine. Featuring a pop-up handle for easy carrying, and perforated “back doors” to access the beer, the Van Can Pack is available now at select Beer Store locations in Ontario for $22.95, with roll-outs planned for Alberta and British Columbia later this month.